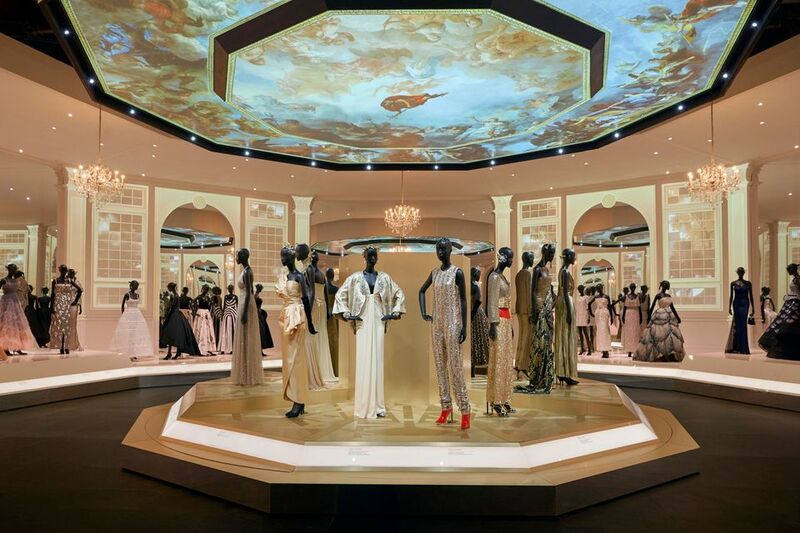 Some critics are already calling Dior: Designer of Dreams (2 February-14 July; tickets £20-£24, concessions available) the greatest fashion show that the Victoria and Albert Museum has ever staged. The show, a version of which was already a hit at the Musée des Arts Decoratifs in Paris, gets off to a bit of a slow start with Dior-related paraphernalia and a section on Christian Dior’s love of English culture and traditions. “I even love English cooking,” the French designer once remarked. Really, we all know everyone will be there for the dresses. The subsequent displays deliver in bucket loads—each room is its own little world, carefully constructed thematically around inspirations for the designs, from historical periods and global cultures to gardens and ballrooms. The exhibition design is breath-taking—sometimes even outshining the dresses—with trailing flowers hanging from the ceiling in the garden room, and spectacular lighting in the “ballroom” that intermittently transforms the space into a dark skyscape with twinkling stars. There are some parts of the show that feel a bit tokenistic—for example, an LGBTQ-style rainbow dress placed in a cabinet makes the subject seem like an afterthought—but overall the show leaves you with a warm, dream-like glow. And a desperate need to go buy something extravagant. Living with Buildings (until 3 March; free) at the Wellcome Collection is a fascinating little show on the impact of architecture on our health. Although the exhibition spans Dickensian slums to the present day, the most interesting aspects revolve around the idealistic architecture of the 20th century and the subsequent problems often laid at the foot of the tower-block architects (which have subsequently been challenged). The exhibition also tracks how some of the reactions to these hi-rises sometimes led to projects that were not so successful themselves. For example, the model village of Poundbury, designed according to the antediluvian architectural principles of Prince Charles, was meant to reduce car use but actually ended up increasing it when compared to similar nearby villages. There are a smattering of artist takes on the subject too, but the most powerful displays are those giving voice to the tenants and homeowners affected by callous developers and councils who betrayed the very people they are meant to serve. There is also a free map highlighting some fine examples of idealistic housing developments in the area surrounding the museum. This weekend is the last chance to flick through Gainsborough’s Family Album (until 3 February 2019; tickets £14, concessions available) at the National Portrait Gallery. This manageable and deceptively captivating show (looking through other people’s family albums is usually recipe for a snooze) includes more than 50 works depicting the artist’s family and builds up an intimate biography of one of the UK’s greatest painters of the 18th century. The exhibition unites all 12 surviving portraits of Gainsborough’s daughters, tracing them from childhood, in works such as the exquisite The Artist’s Daughters chasing a Butterfly (around 1756), to young adulthood, with the rarely exhibited Margaret and Mary Gainsborough (around 1770-74). The two panels of Mary and Margaret Gainsborough, the Artist’s Daughters (around 1760-61), stuck together at the wrong height, show painting at its most exquisitely tender. The survey also includes some hairier family members: the Gainsborough family pets as seen in the drawing Tristram and Fox (around 1760s), which is being exhibited for the first time. Visitors will also get to see the freshly restored Portrait of Gainsborough Dupont (1773), which was apparently painted in less than an hour.